Model 004 of the Dojo Pro series is the 'Satori' - the Japanese word for enlightenment - called so because of the Lotus flower themed tsuba – an exact copy of an actual edo era antique and tribute to Zen Buddhisms impact on the way of the Warrior (Bushido). 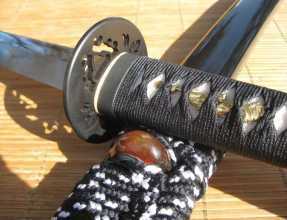 Like all the fittings of these swords, the tsuba is solid iron – but so is the fuchi (band at the top of the handle) AND the kashira (end cap) – all acting in harmony to strongly reinforce the structural integrity of the entire handle in a way that is almost never seen on other swords under the $500 price point (never mind on swords under $300!). The tsuka/handle assembly itself is exceptionally tight and well put together, double pegged with black silk ito wrapped over REAL rayskin, wrapped in the traditional alternating style to ensure it does not loosen with useage, and tightly bound to a quality wooden core. 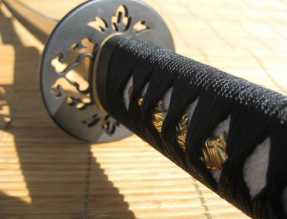 As you can see from the picture, these swords feature high end brass seppa (spacers), hard wearing synthetic black and white interlaced sageo to tie the saya to your belt. The saya (sheath) itself thick and made from quality wood, after all you don’t put hand cut and polished buffalo horn Kurikata, Koguchi and Kojiri detailed in a rich chocolate brown that illuminates red in direct sunlight. Commenting on it purely as a display piece. The blade itself came in already scuffed up. All along the spine there are scratches in spots up and down the blade. 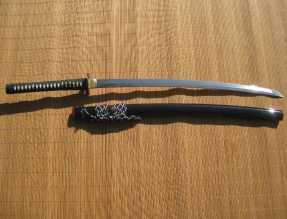 At the tip, the kissaki, is actually marred by a very noticeable burr on one side of the bevel. The polish is very rough and noticeably uneven 1/3 up the blade. The finish is just disappointing. I had expected a razor sharp blade but the edge is sharp enough i guess. This being my first practical cutting sword I know not what to actually expect. On the upside, all the fittings are very tight, the grip is wonderfully wrapped. Scabbard/Saya interior is extremely waxy, to the point where no matter how carefully you put the freshly cleaned and oiled sword back into it, when it is drawn, it will always have chunks of wax residue all along the blade. However, this was mentioned in the review of the blade. So it was to be expected. Externally the saya is very good looking and had no visible blemishes of any kind. Which is fantastic if the sword serves mainly as a display piece. Have not had the chance to cut with it so i cannot comment of edge retention or functionality. It feel good in the hand. 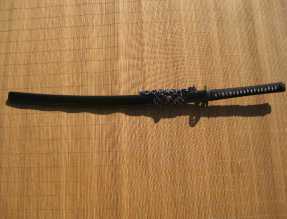 Overall I believe my expectation were set too high, maybe what I wanted only exist with the blades $800 and up. Its a good looking display piece.